A friend recently sent me stuff on the markets from Harry Dent. He now thinks that the Dow will rise this year to 30000 or higher before dropping to 3800. As you may know this fellow has a different methodology and relies to a great extent on such factors as population growth (or shrinkage) and similar things. I have no idea what to make of it but being very gullible I do try to keep an open mind and search for things that may support his views (and negate the immediate bear view). Starbucks is such a stock. Looking at the long-term chart of SBUX, it is possible to discern a fairly straightforward 5 wave sequence going all the way back to 1992 when it went public (at $17 but there have been stock splits). The only thing that is not clear is if the sequence is complete. 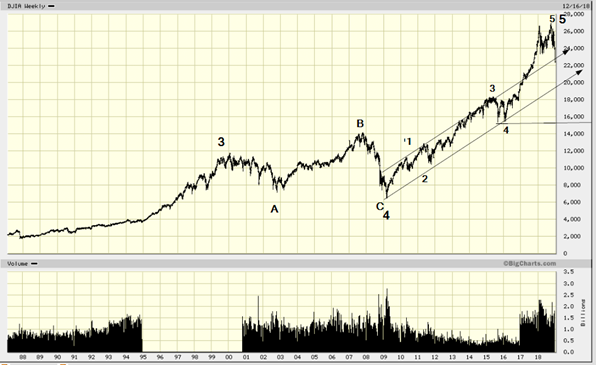 Wave 4 in the Bigchart is without any doubt a 4th wave, an A, triangle? B and C structure where the waves A and C are equal, but despite already being about as large as wave 1, could nevertheless rise further to about $80 or more. 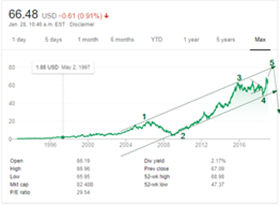 Dent’s argument is basically that in the last year of a long-term uptrend the increases are normally rather explosive. If so such a scenario would be quite reasonable. 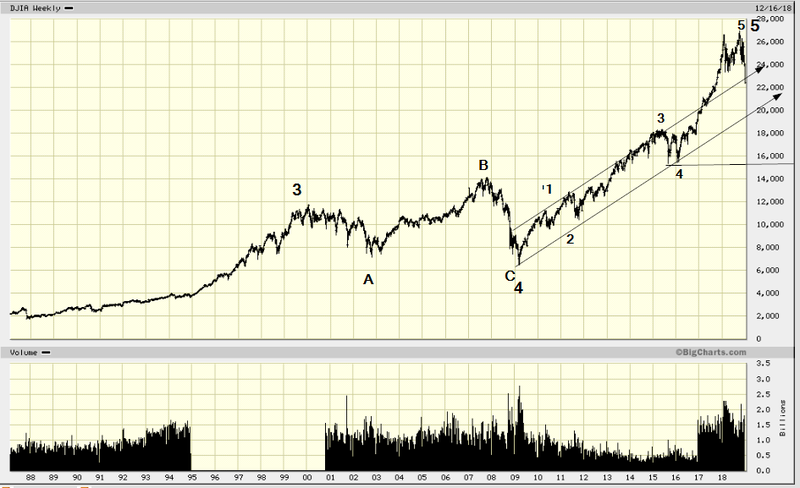 We would now be in wave 4 of 5 or already in wave 5 of 5. So one could short this stock with a stop at around $68, and do it again at, say $78 if that does not work right away. Or you can wait and only the the second trade or whatever iteration of it that you prefer. Put options may be an even better choice. 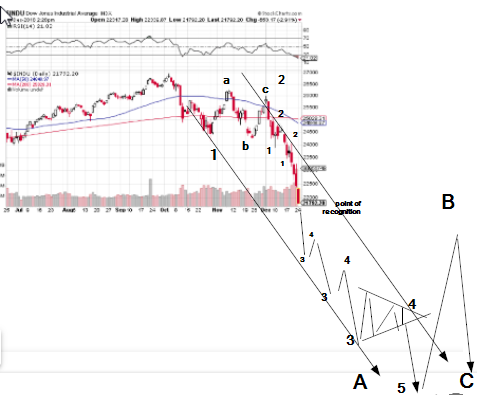 My educated guess is that we are today at the midpoint of wave 3 of 3 which means that we are also at the midpoint of the whole thing, that is what will probable shape out to be wave A of a large A-B-C correction or just wave A of a large triangle that itself starts with an A-B-C. We closed at 21792 and started from a peak of, I believe, 26952 on Oct the 3d. so 5160 points so far. If this is the midpoint we should get about the same number of points below today’s level. 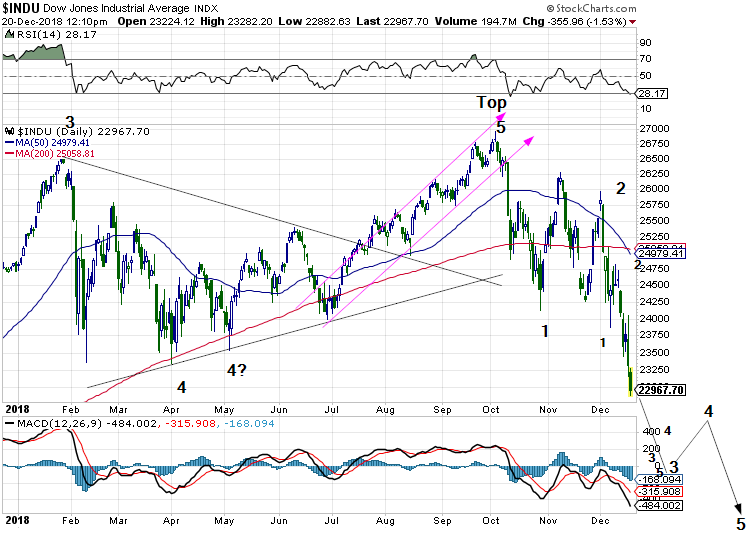 21792-5160=16632 which does not take into account a possible gap! All the Trump gains in the stock market are now gone and I have no doubt that he and Mnuchin will be able to erase much of the rest as well. 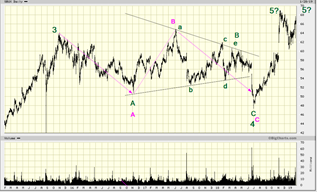 Note ; wave 4 of A is more likely to be a zig-zag that goes much higher than the triangle shown. This because of alternation between waves 2 and 4. @ is a flat so 4 might become a zig-zag.